A late Kieran Trippier leveller earned a Barnsley side, who twice came from behind, a point against 10-man Leeds. The Tykes had taken the lead when Jason Shackell powered in a shot but Luciano Becchio's header evened things up. A controversial penalty by Max Gradel put Leeds ahead only for Matt Hill to slot in to haul the visitors level. Despite Leeds losing Bradley Johnson to a second yellow card, Gradel restored their lead before Trippier's 25-yard free-kick meant the spoils were shared. The home side will be left ruing a setback to their promotion hopes while Barnsley will be pleased their determination was rewarded with a point. The visitors had started the brighter and went ahead after only two minutes as Shackell blasted past Leeds keeper Kasper Schmeichel at the far post. Leeds responded with a Gradel free-kick coming back off the crossbar and hitting keeper Luke Steele on the back of the head before going inches wide. However, the home side eventually equalised when Steele missed Neil Kilkenny's inswinging left-wing cross and Becchio nodded into an empty net. Referee Mark Clattenburg then controversially ruled that Hill had fouled Gradel, who picked himself up to score from the spot eight minutes before the interval. Hill made amends for any mistake by latching on to a Jacob Mellis through ball before calmly slotting home. Johnson dismissal appeared to give Barnsley the initiative but Gradel grabbed a second with a curling effort into the far corner in the 70th minute. Barnsley refused to give up and were rewarded when Trippier's free-kick found its way through the Leeds wall and past an unsighted Schmeichel. 90:00+5:21 The referee ends the match. 90:00+4:48 Effort from the edge of the area by Garry O'Connor goes wide of the left-hand post. 90:00+4:36 A cross is delivered by Matthew Hill. 90:00+3:16 Jim O'Brien sends in a cross, save made by Kasper Schmeichel. 90:00+2:49 The ball is sent over by Jim O'Brien, Alex Bruce makes a clearance. 90:00+1:16 Sanchez Watt gives away a free kick for an unfair challenge on Jim O'Brien. Luke Steele takes the direct free kick. 90:00+0:25 Jacob Butterfield produces a left-footed shot from just outside the penalty box that misses to the left of the goal. 90:00+0:11 Kieran Trippier crosses the ball. 88:57 The referee blows for offside. Luke Steele takes the free kick. 88:57 Substitution Andy Gray is brought on as a substitute for Jacob Mellis. 87:57 The ball is sent over by Eric Lichaj, Paul McShane manages to make a clearance. 87:30 Max Gradel crosses the ball, clearance made by Jason Shackell. 86:04 Inswinging corner taken right-footed by Neil Kilkenny from the left by-line, Jason Shackell manages to make a clearance. 85:38 Max Gradel takes the chance to get an effort at goal. Jason Shackell gets a block in. 83:54 Shot from outside the area by Jacob Butterfield misses to the left of the goal. 82:55 Shot from just outside the box by Max Gradel goes over the target. 81:56 Foul by Paul McShane on Davide Somma, free kick awarded. Free kick taken by Neil Kilkenny. 81:04 Andrew O'Brien gives away a free kick for an unfair challenge on Garry O'Connor. 81:04 GOAL - Kieran Trippier:Leeds 3 - 3 Barnsley Kieran Trippier scores a goal from outside the area to the bottom right corner of the goal. Leeds 3-3 Barnsley. 79:39 Diego Arismendi takes a shot. Save made by Kasper Schmeichel. Inswinging corner taken by Jacob Butterfield, clearance by Alex Bruce. 79:04 Kieran Trippier sends in a cross, Alex Bruce manages to make a clearance. Corner taken right-footed by Diego Arismendi from the right by-line, Sanchez Watt makes a clearance. 77:27 Inswinging corner taken by Neil Kilkenny from the left by-line, Jason Shackell manages to make a clearance. 77:27 Booking Booking for Max Gradel for dissent. 77:04 Shot from 20 yards from Davide Somma. Jason Shackell gets a block in. 76:26 Jason Shackell concedes a free kick for a foul on Davide Somma. Direct free kick taken by Eric Lichaj. 73:48 Substitution Jacob Butterfield replaces Bobby Hassell. 71:46 Foul by Davide Somma on Jacob Mellis, free kick awarded. The free kick is delivered right-footed by Kieran Trippier from right channel, Kasper Schmeichel makes a save. 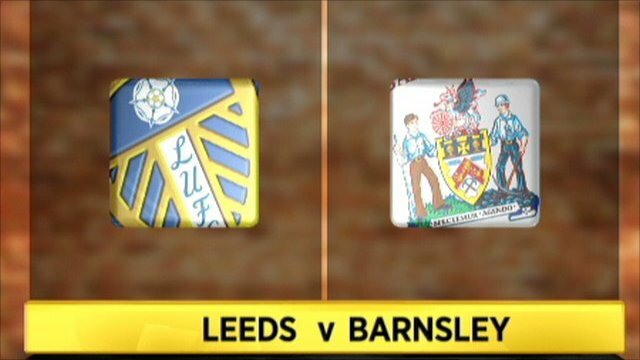 69:16 GOAL - Max Gradel:Leeds 3 - 2 Barnsley Max Gradel fires in a goal from just inside the area to the bottom right corner of the goal. Leeds 3-2 Barnsley. 68:43 Garry O'Connor concedes a free kick for a foul on George McCartney. Kasper Schmeichel takes the direct free kick. 67:43 Free kick awarded for a foul by Jim O'Brien on Sanchez Watt. Kasper Schmeichel takes the direct free kick. 67:43 Booking Jim O'Brien shown a yellow card. 66:39 Free kick awarded for an unfair challenge on Diego Arismendi by Neil Kilkenny. Free kick crossed by Kieran Trippier, clearance made by Alex Bruce. 65:24 Substitution (Leeds) makes a substitution, with Sanchez Watt coming on for Robert Snodgrass. 65:24 Substitution Davide Somma on for Luciano Becchio. 65:05 The ball is delivered by Max Gradel, Paul McShane makes a clearance. 64:47 Max Gradel produces a cross, clearance by Matthew Hill. 60:55 Paul McShane takes a shot. Blocked by Jacob Mellis. 59:32 Danny Haynes produces a left-footed shot from the edge of the area and misses to the left of the goal. 58:40 The referee gives a free kick against Jonathan Howson for handball. Free kick taken by Diego Arismendi. 56:35 Corner taken by Neil Kilkenny, Alex Bruce produces a header from inside the six-yard box that clears the bar. 55:49 Shot from 12 yards from Paul McShane. Save by Kasper Schmeichel. 55:15 Jacob Mellis decides to take a short corner. 53:41 Paul McShane challenges Luciano Becchio unfairly and gives away a free kick. Kasper Schmeichel restarts play with the free kick. 53:01 Free kick awarded for a foul by Robert Snodgrass on Matthew Hill. Free kick taken by Jason Shackell. 51:43 Bradley Johnson concedes a free kick for a foul on Jacob Mellis. Kieran Trippier crosses the ball in from the free kick, clearance made by Alex Bruce. Jason Shackell challenges Alex Bruce unfairly and gives away a free kick. Kasper Schmeichel takes the direct free kick. 51:43 Sent off Bradley Johnson is shown a red card for second bookable offence. 47:38 Nathan Doyle provided the assist for the goal. 47:38 GOAL - Matthew Hill:Leeds 2 - 2 Barnsley A goal is scored by Matthew Hill from the edge of the area to the bottom right corner of the goal. Leeds 2-2 Barnsley. 45:25 Danny Haynes is ruled offside. Kasper Schmeichel takes the free kick. 45:00+2:05 The half-time whistle blows. 45:00+0:36 Kieran Trippier sends in a cross. 45:00 Substitution Nathan Doyle leaves the field to be replaced by Jim O'Brien. 44:38 Free kick awarded for a foul by Andrew O'Brien on Garry O'Connor. Free kick taken by Luke Steele. 43:50 A cross is delivered by Robert Snodgrass. 43:03 Bradley Johnson gives away a free kick for an unfair challenge on Kieran Trippier. Bobby Hassell takes the direct free kick. 43:03 Booking Bradley Johnson is shown a yellow card. 42:25 The ball is swung over by Robert Snodgrass, clearance by Bobby Hassell. 40:57 Danny Haynes fouled by Alex Bruce, the ref awards a free kick. Free kick crossed by Kieran Trippier, Max Gradel gets a block in. 40:16 The ball is delivered by Kieran Trippier, clearance by George McCartney. 38:23 Inswinging corner taken from the left by-line by Neil Kilkenny, Bradley Johnson takes a shot. Luke Steele makes a save. Correction - 36:51 Foul by Matthew Hill on Max Gradel, Penalty awarded. 36:51 Paul McShane gives away a Penalty for an unfair challenge on Max Gradel. 36:51 GOAL - Max Gradel:Leeds 2 - 1 Barnsley Max Gradel scores a penalty. Leeds 2-1 Barnsley. 35:38 Booking Matthew Hill receives a yellow card for unsporting behaviour. 33:33 Jonathan Howson takes a shot. Save by Luke Steele. 33:14 Foul by Jacob Mellis on Jonathan Howson, free kick awarded. Direct free kick taken by Neil Kilkenny. 32:26 The referee blows for offside against Luciano Becchio. Luke Steele restarts play with the free kick. 31:45 Jacob Mellis challenges Robert Snodgrass unfairly and gives away a free kick. Robert Snodgrass takes the free kick. 30:27 Foul by Bradley Johnson on Garry O'Connor, free kick awarded. Kieran Trippier crosses the ball, Paul McShane takes a shot. Save by Kasper Schmeichel. 29:17 Kieran Trippier produces a cross, Andrew O'Brien manages to make a clearance. 27:35 Kieran Trippier sends in a cross, Garry O'Connor produces a right-footed shot from inside the area that clears the bar. 27:05 Bradley Johnson gives away a free kick for an unfair challenge on Nathan Doyle. Direct free kick taken by Luke Steele. 24:55 Robert Snodgrass challenges Jacob Mellis unfairly and gives away a free kick. Free kick taken by Luke Steele. 24:47 Eric Lichaj sends in a cross, Jason Shackell makes a clearance. 22:24 The assist for the goal came from Neil Kilkenny. 22:24 GOAL - Luciano Becchio:Leeds 1 - 1 Barnsley Luciano Becchio scores a headed goal from close range. Leeds 1-1 Barnsley. 22:05 Corner taken short by Max Gradel. 22:00 The ball is delivered by Robert Snodgrass, clearance made by Bobby Hassell. Correction - 21:29 The referee blows for offside against Danny Haynes. Indirect free kick taken by Kasper Schmeichel. 21:29 Danny Haynes is ruled offside. Kasper Schmeichel restarts play with the free kick. Correction - 16:55 The ball is sent over by Bradley Johnson. Close range header by Jonathan Howson goes wide of the left-hand upright. 16:55 The ball is crossed by Bradley Johnson. 15:56 Effort from inside the area by Luciano Becchio misses to the left of the goal. 12:56 Inswinging corner taken by Neil Kilkenny, Luciano Becchio takes a shot. Save by Luke Steele. 11:55 Free kick awarded for an unfair challenge on Luciano Becchio by Paul McShane. Max Gradel has a direct shot on goal from the free kick, Luke Steele makes a save. 11:19 Unfair challenge on Bradley Johnson by Garry O'Connor results in a free kick. Kasper Schmeichel takes the direct free kick. 10:40 Foul by Neil Kilkenny on Jacob Mellis, free kick awarded. Direct free kick taken by Jason Shackell. 8:46 Effort on goal by Robert Snodgrass from just inside the area clears the bar. 7:56 The referee blows for offside. Free kick taken by Kasper Schmeichel. 4:46 Unfair challenge on Bradley Johnson by Kieran Trippier results in a free kick. Direct free kick taken by Andrew O'Brien. 1:33 Bradley Johnson concedes a free kick for a foul on Garry O'Connor. 1:33 GOAL - Jason Shackell:Leeds 0 - 1 Barnsley A goal is scored by Jason Shackell from close in to the top left corner of the goal. Leeds 0-1 Barnsley. 0:31 Max Gradel is flagged offside by the assistant referee. Indirect free kick taken by Luke Steele. 0:06 Neil Kilkenny fouled by Nathan Doyle, the ref awards a free kick. Neil Kilkenny takes the free kick.